1 3/8" square 3/8" 1/2" 5/8" 3/4"
1 3/4" square 1/4" 1/2" 3/4" 1"
2 1/4" square 1/2" 3/4" 1" 1 1/4"
2 3/4" square 1/2" 7/8" 1 1/8" 1 1/2"
3 1/4" square 1/2" 1" 1 1/2" 2"
3 3/4" square 3/4" 1 1/4" 2" 2 1/2"
4 1/4" square 1" 1 1/2" 2" 3"
4 3/4" square 1" 2" 2 1/2" 3"
5 1/4" square 1" 2" 3" 4"
We can make a holder for the 4-way die that will also allow you to use standard vee dies. 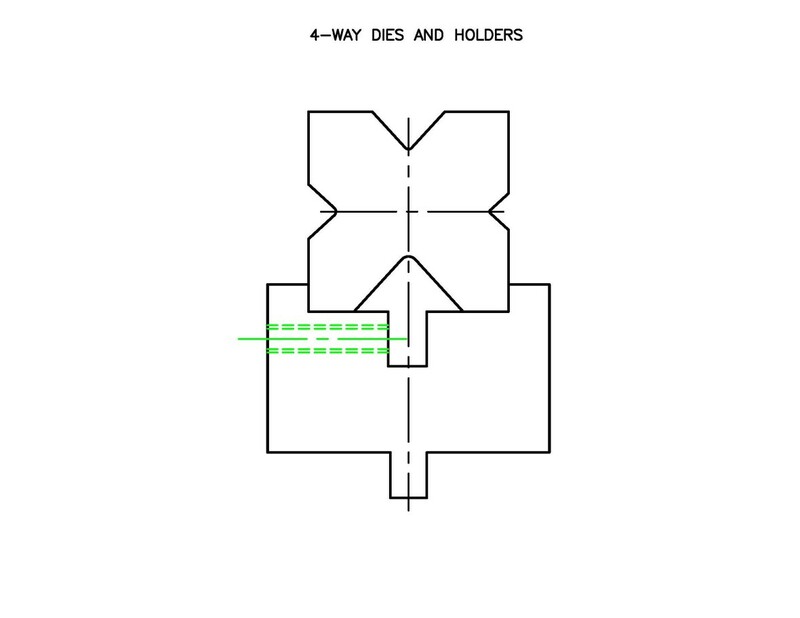 The height of the 4-way holder depends on your press brake. We can customize a 4-way die to fit your application with acute angle vees, channels, or other shapes.